Change in the Object Taken. In law the taking of the movable property of another under constraint of force or fear; in the Bible the word is sometimes applied to the forcible taking of land or of slaves. From the penalty for robbery (at least under certain conditions), as prescribed in Lev. v. 20, 26 (A. V. vi. 1-7), the punishment of stripes is excluded. In this passage, as interpreted by the sages, an oath is imposed upon one charged with that of robbery or certain other offenses against property, and a penalty for perjury is added to that for robbery if he afterward confesses. Yet the penalty seems wholly inadequate: the guilty party shall restore that which he took by robbery, and add the fifth part to it; moreover, he shall bring his guilt-offering of a ram without blemish; and then he shall be forgiven. Oppression ("'osheḳ") is both here and in Lev. xix. 13 named together with robbery; this is committed where one who has lawfully come into possession of his neighbor's goods withholds them unlawfully from the rightful owner. 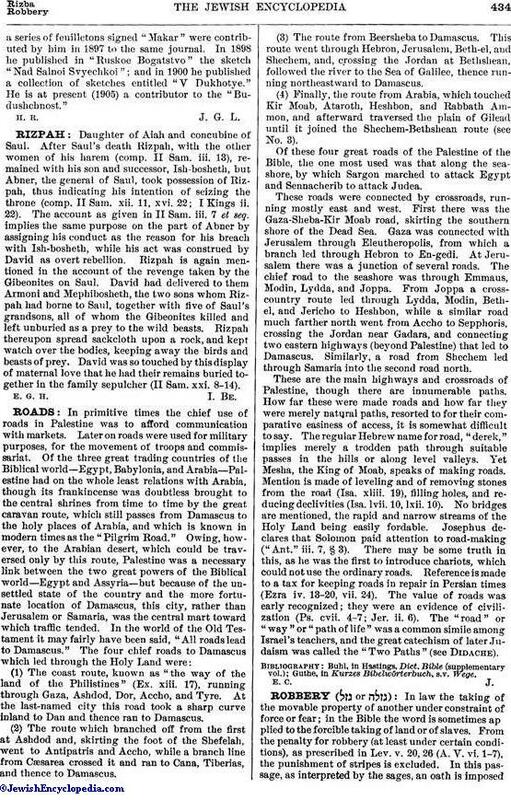 The Mishnah and the Gemara deal with the robber even less severely than Scripture, the reason probably being that, when speaking of the robber, the sages had not in mind the avowed bandit, but rather the publican or some other tool of the Romans, who by abusing his power stripped his fellow Israelites of their goods. It was the policy of the sages not to drive such men, when they happened to submit to their judgment, into open hostility, nor to discourage their return to a more patriotic course of life (B. Ḳ. 94a). Among robbers was reckoned (at least in so far as he was compelled to restore possession before he could enforce his claims) one who without judicial sanction seized the goods of a debtor (Shebu. vii. 2); also one who cut fruits or plants from land which was unlawfully in his possession (Suk. 30a). Leniency toward the robber was especially marked in the days of Judah the Patriarch, it being declared: "When a robber repents and voluntarily offers to pay for the things that he has taken, and which he can not restore in kind, it is better not to accept the money from him" (B. Ḳ. 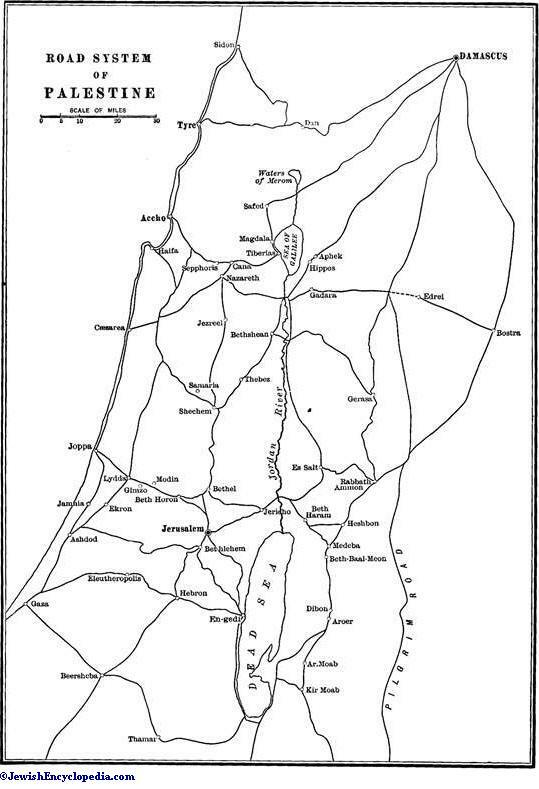 l.c.). However, some of the medieval standards regard this practise as only temporary, not as an institution (see Joseph Caro, Commentary on Maimonides' "Yad," Gezelah, i. 13; idem, Shulḥan 'Aruk, Ḥoshen Mishpaṭ). It is curious how Maimonides himself (l.c. v. 9) couples tribute-takers and bandits ( ) as men who are presumed to have acquired all their means by robbery, that is, by taking things unlawfully. The sages introduced into the question of robbery an element which greatly modifies the rights and duties of those claiming goods taken, namely, the despair ("yi'ush") of the owner; i.e., his giving up the hope of recovering his own. What constitutes such despair or abandonment is rather vaguely defined; at any rate the burden of proof is on him who alleges such "yi'ush." Another element is change in the form of the article taken so that it loses its name or identity (B. Ḳ. ix. 1), as in the case of wood made into implements, or wool into garments. The laws of robbery are set forth (aside from those already mentioned) by Maimonides (l.c. i-v.) substantially as follows: Robbery, that is, taking by force, is forbidden by the Torah, no matter what the value of the object, and whether it belongs to an Israelite or to an idolater. The robber is bound to return the object itself (Lev. v. 23). When it is changed or lost, he pays the price, whether he confesses or is condemned upon the evidence of witnesses. Where one has taken a beam and built it into a house, he should, according to the letter of the Torah, tear down the whole structure, if necessary; but the sages have ordained that, to avoid such a great loss, he may pay the price of the beam. If, however, the beam has been made part of a "sukkah" (booth for the Feast of Sukkot), it should be returned after the feast; and so in like cases. Though to take a thing worth less than a peruṭah (¼ cent) is sinful, the law of restoration can not be applied in such a case. Where one has taken a thing by force in a settled country, he may not, unless with the consent of the owner, return it in the desert; it remains at the robber's risk till he brings it to a settled region. Where one has taken money, but has repaid it in his account with the person robbed, or has put it into the latter's purse (containing other money) even without the latter's knowledge, he has cleared himself of guilt. When an object forcibly taken has not been changed in form, though the owner may have despaired of its return, after the robber's death his sons must return it. But if changed, though the owner has not despaired, it is acquired by the robber, and the latter pays the amount at which it was valued at the time of the robbery; for the text says "he shall return the thing which he has robbed," which means "the thing in the state in which it was when taken." The sages, to encourage repentance, have ordained that if the thing taken increases in value after being despaired of by the owner, the robber is entitled to the increase, which must be paid to him when he returns the object. This refers to a sheep covered with a new fleece of wool, or to a cow becoming big with calf, or the like, but not to an increase in the market price. But if the cow has calved, or the sheep has been shorn before the owner despaired, then, according to the prevailing opinion (B. Ḳ. 95), the calf or fleece, though it was an accretion after the robbery, must be restored to the owner, or its value paid to him. On the other hand, where the increase in value arises through the work and outlay of the robber, e.g., where he has fattened an animal, the robbed party, on restoration, must reimburse him for the increase in value. According to some authorities, the despair of the owner, or the sale or gift by the robber to a third party, confers ownership on the last-named, and the owner can then demand only compensation in money from the robber; but this ruling is disputed. What constitutes a change? When one takes a bar of metal and coins it no change is involved; for the coin may be melted into a bar again. But if coins or vessels are taken and melted into bars, this is a change; for if the bars are minted or wrought again into çoins or vessels, such coins or vessels would be new ones. If boards are taken and framed into a box, which can be reduced to boards by withdrawing the nails or screws, there is no change; but if a tree or logs be cut up into planks or boards, there is a change. So also a change results from the sawing of a plank into boards, or from taking wool and dyeing or carding and bleaching it, or from taking cloth and cuttingit up and sewing it into garments; for in each case the object is known by a new name. Where forcible possession is taken of a piece of land the disseizor can give no better title than he has himself; and though the land has been sold "a thousand times" it goes back to the true owner without outlay on his part even for improvements (B. Ḳ. l.c. ), the last holder having no recourse except on the warranty of his vendor. According to Maimonides, one who buys stolen goods from a man known to be a thief is bound to restore them to the true owner in like manner as land. When a lamb grows into a ram, or a calf into an ox, the robber pays only its value at the time of taking, and this though the owner had not abandoned the hope of recovery. Where an implement is broken while with the robber, he should pay the value of the implement at the time when he took it; but the owner may, if he chooses, claim the broken pieces and the difference in money. As a rule, in all cases in which the article can not be returned the robber pays the value which it bore at the time of the robbery (B. Ḳ. ix. 1). 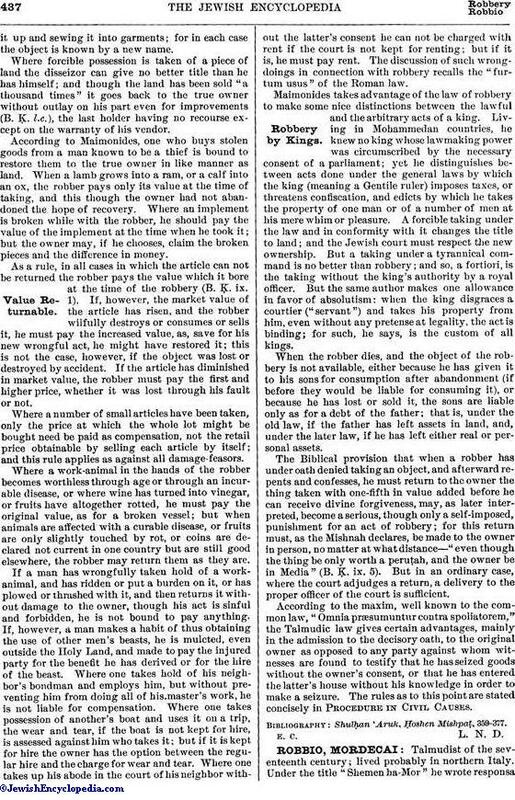 If, however, the market value of the article has risen, and the robber wilfully destroys or consumes or sells it, he must pay the increased value, as, save for his new wrongful act, he might have restored it; this is not the case, however, if the object was lost or destroyed by accident. If the article has diminished in market value, the robber must pay the first and higher price, whether it was lost through his fault or not. Where a number of small articles have been taken, only the price at which the whole lot might be bought need be paid as compensation, not the retail price obtainable by selling each article by itself; and this rule applies as against all damage-feasors. Where a work-animal in the hands of the robber becomes worthless through age or through an incurable disease, or where wine has turned into vinegar, or fruits have altogether rotted, he must pay the original value, as for a broken vessel; but when animals are affected with a curable disease, or fruits are only slightly touched by rot, or coins are declared not current in one country but are still good elsewhere, the robber may return them as they are. If a man has wrongfully taken hold of a work-animal, and has ridden or put a burden on it, or has plowed or thrashed with it, and then returns it without damage to the owner, though his act is sinful and forbidden, he is not bound to pay anything. If, however, a man makes a habit of thus obtaining the use of other men's beasts, he is mulcted, even outside the Holy Land, and made to pay the injured party for the benefit he has derived or for the hire of the beast. Where one takes hold of his neighbor's bondman and employs him, but without preventing him from doing all of his master's work, he is not liable for compensation. Where one takes possession of another's boat and uses it on a trip, the wear and tear, if the boat is not kept for hire, is assessed against him who takes it; but if it is kept for hire the owner has the option between the regular hire and the charge for wear and tear. Where one takes up his abode in the court of his neighbor without the latter's consent he can not be charged with rent if the court is not kept for renting; but if it is, he must pay rent. The discussion of such wrongdoings in connection with robbery recalls the "furtum usus" of the Roman law. Maimonides takes advantage of the law of robbery to make some nice distinctions between the lawful and the arbitrary acts of a king. Living in Mohammedan countries, he knew no king whose lawmaking power was circumscribed by the necessary consent of a parliament; yet he distinguishes between acts done under the general laws by which the king (meaning a Gentile ruler) imposes taxes, or threatens confiscation, and edicts by which he takes the property of one man or of a number of men at his mere whim or pleasure. 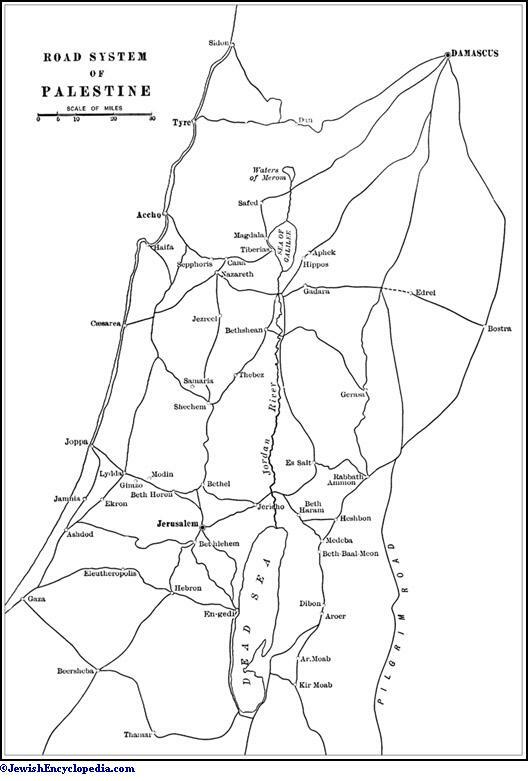 A forcible taking under the law and in conformity with it changes the title to land; and the Jewish court must respect the new ownership. But a taking under a tyrannical command is no better than robbery; and so, a fortiori, is the taking without the king's authority by a royal officer. But the same author makes one allowance in favor of absolutism: when the king disgraces a courtier ("servant") and takes his property from him, even without any pretense at legality, the act is binding; for such, he says, is the custom of all kings. When the robber dies, and the object of the robbery is not available, either because he has given it to his sons for consumption after abandonment (if before they would be liable for consuming it), or because he has lost or sold it, the sons are liable only as for a debt of the father; that is, under the old law, if the father has left assets in land, and, under the later law, if he has left either real or personal assets. 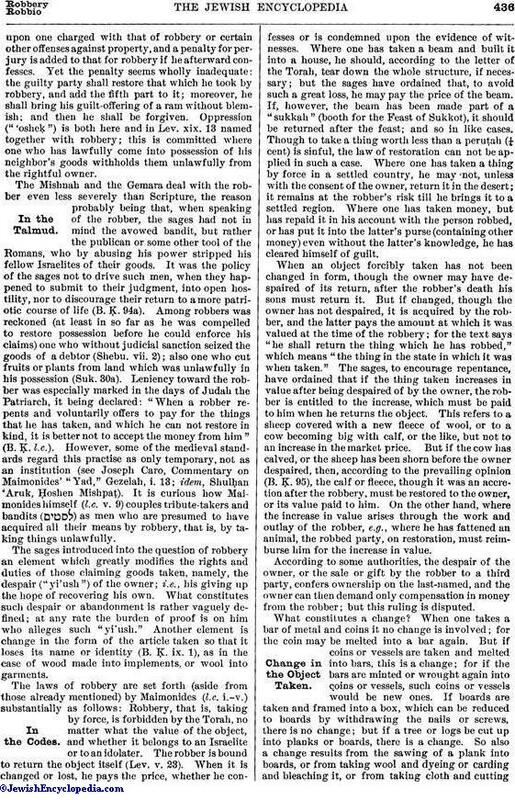 The Biblical provision that when a robber has under oath denied taking an object, and afterward repents and confesses, he must return to the owner the thing taken with one-fifth in value added before he can receive divine forgiveness, may, as later interpreted, become a serious, though only a self-imposed, punishment for an act of robbery; for this return must, as the Mishnah declares, be made to the owner in person, no matter at what distance—"even though the thing be only worth a peruṭah, and the owner be in Media" (B. Ḳ. ix. 5). But in an ordinary case, where the court adjudges a return, a delivery to the proper officer of the court is sufficient. According to the maxim, well known to the common law, "Omnia præsumuntur contra spoliatorem," the Talmudic law gives certain advantages, mainly in the admission to the decisory oath, to the original owner as opposed to any party against whom witnesses are found to testify that he has seized goods without the owner's consent, or that he has entered the latter's house without his knowledge in order to make a seizure. The rules as to this point are stated concisely in Procedure in Civil Causes. Shulḥan 'Aruk, Ḥoshen Mishpaṭ, 359-377.